We are many and we are strong and the momentum is on our side. 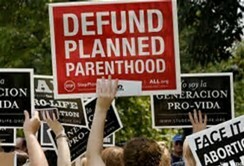 To support Congress moving forward to defund Planned Parenthood, pro-lifers will hold rallies on Saturday, February 11. Groups will gather outside nearly 200 facilities across the country and the nation’s capital for #DefundPP rallies. Locations and details can be found at: http://protestpp.com/locations/. 1. The 34% of U.S. abortions performed by Planned Parenthood underscores the fact that they are not a general healthcare service provider. 4. Moving Planned Parenthood’s funding to Federally Qualified Heath Centers will offer women and families a wider range of healthcare services and a higher standard of care. There is also coordinated support overseas at the London headquarters of the International Planned Parenthood Federation, which was recently defunded by Executive Order. Onward Christian soldiers! Onward lovers of life regardless of your creed! May God send his angels to lead the way and protect us.